If you have been working with computers for a while you will have learned to be hyper-careful with important files because your system may crash or do something awful to your work at any time. For me this means frequently saving my work and also frequently saving a new version of the work as I go along, each with a new filename. This usually takes the form of newfile1, newfile2, newfile3 and so on.If I think ahead or plan on making many iterations I will name them newfile01, newfile02etc. The reason being that as soon as you get to newfile10, the computer starts to put things in the wrong order if you don’t include the zero. So newfile01, newfile02 … newfile09, newfile10 works, without the zero you typically get newfile1, newfile10, newfile2, … newfile9. So over the years the dumb computers have trained me to always use a 2 (or even 3) digit numbering system. Nonetheless, there are still the times where I only expect one or two versions, and I simply write the single digit numeral. The other day this happened and in time that simple file had 9 iterations. 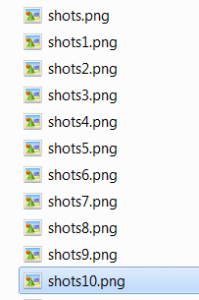 I realized I was about to go into double digits, so I opened up my file browser to fix my naming convention. Well, lo and behold it seems that Windows 7 can now count properly! It seems to know that 10 is more than 2. Amazing! After all these years some kind soul at Microsoft has fixed this little usability irritation. Huzzah!